Zipping through the Douro valley in northern Portugal in a 21st century car, it can be challenging to discern the real brutality of the landscape. 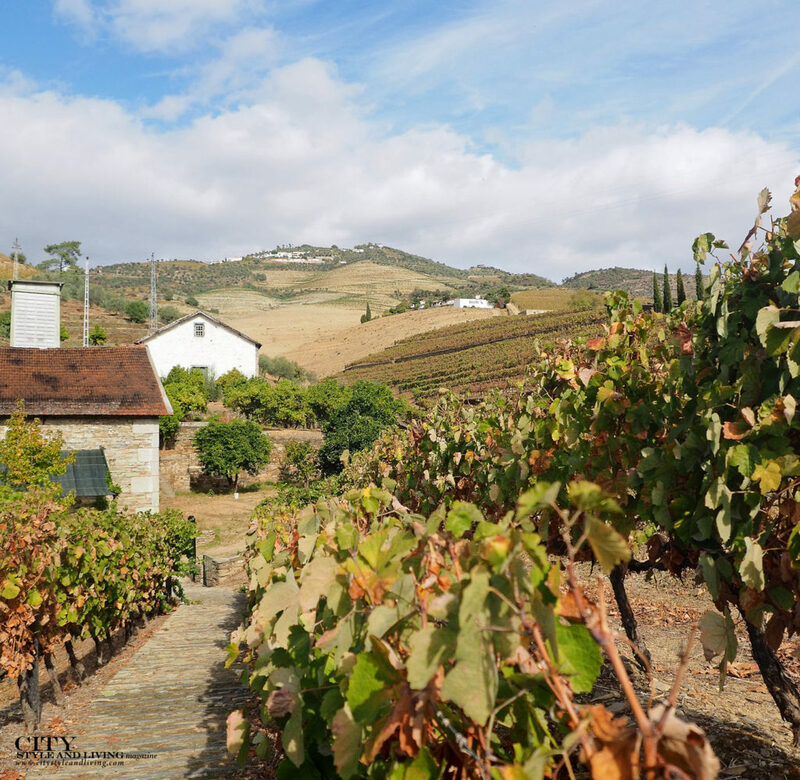 Although the serpentine twists alongside the emerald river give a clue, to truly appreciate the natural and manmade contours of this Portuguese wine region, you need to wander the vineyards. At Quinta do Vallado near Régua, co-owner and head of agriculture Francisco Ferreira takes me on a tour of his 50-hectare vineyard. The grapes have been harvested earlier than usual to be turned into port and wine and the leaves have turned gold. He pauses in an old portion of land where many grape varieties are planted in one parcel. Today, with mechanized picking there is less density and each parcel contains a single grape variety. He bends down at what appears to be nothing more than a knobbed, discarded piece of wood. “Old vines are like sculpture, they are hollow. Somehow, every year, they still produce,” he remarks fondly. After phylloxera swept the continent, vineyards were painstakingly carved to form steep terraces demarcated by hand formed stone walls. “The workers are like heroes with baskets on their back – they are people with power,” submits Ferreira. Indeed, sepia photos in the tasting room of Quinta do Bomfim in Pinhão, owned by Symington, the largest landowner and producer in the region, attest to this tradition of hand-picking grapes. 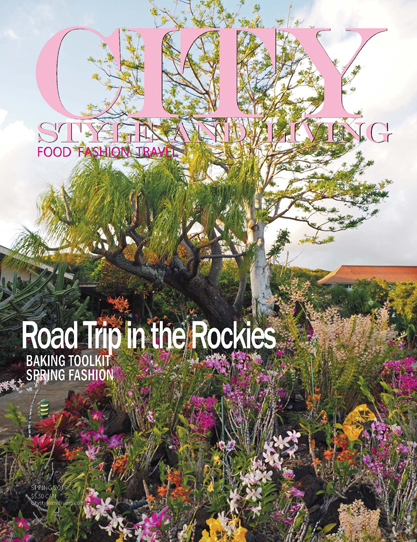 Workers haul loaded baskets on steep inclines. “In old times grape pickers had baskets and musical instruments and sang so they wouldn’t eat the grapes,” says João Silva who leads me on a tour through the facility. As elsewhere in the world the elements of differentiation in Portugal – altitude, grape variety, and soil – what the French call terroir, produces wines that are an expression of their precise location. Here, hot summers and cold winters and a soil that is primarily schist, a razor sharp stone, has led to robust red wines. Traditionally, these took the form of fortified wine – port – which was transported on the river to Vila Nova de Gaia (across from the city of Port) to be bottled. Increasingly though, producers have begun to use many of the same grapes used in port to make red wine. With this expansion of the wine business, tourism has grown too. 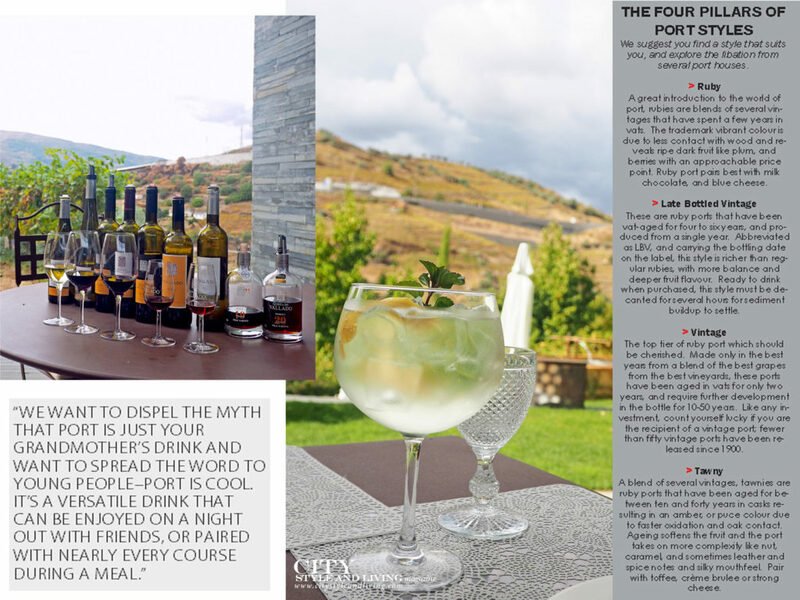 In fact, the wine business and wine tourism has become so lucrative that SoGrape which made its name with Mateus now welcomes 45 000 visitors a year at its winery and tasting room. Even port has had a sort of revival. “We want to dispel the myth that port is just your grandmother’s drink and want to spread the word to young people—port is cool. 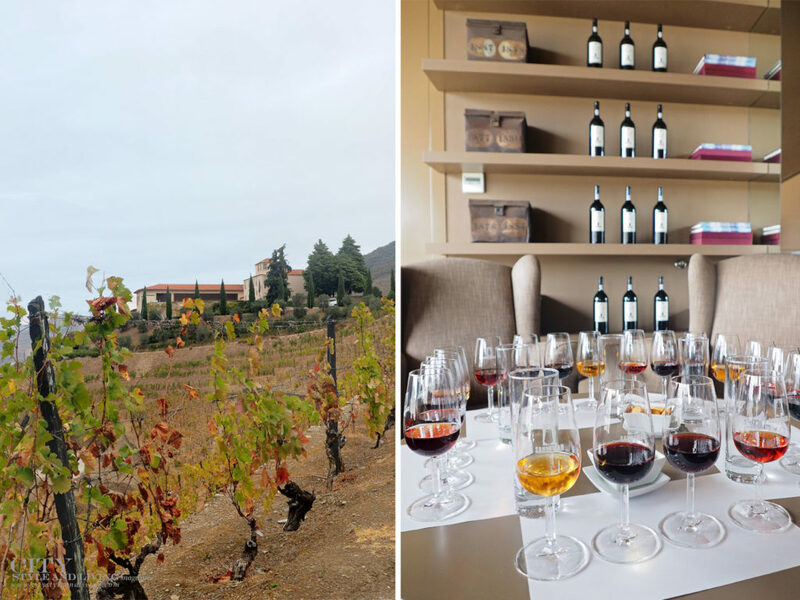 It’s a versatile drink that can be enjoyed on a night out with friends, or paired with nearly every course during a meal.” says Ines Vaz, Press Officer of SoGrape as we taste a flight of port at Quinta do Seixo, Sandeman in the Douro Valley. 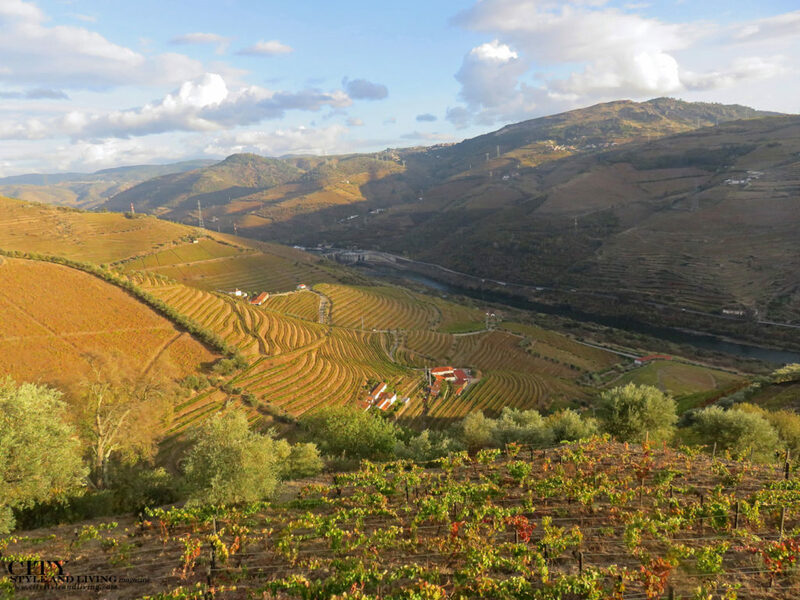 Douro is comprised of 500 000 acres, and 3 subregions: baixo corgo, alto corgo and Douro superior. 1756 year the boundaries were made in Douro, making it the oldest officially demarcated wine region in the world. 40 feet is how far the vine roots can go down in search of water. Vines here are not watered. 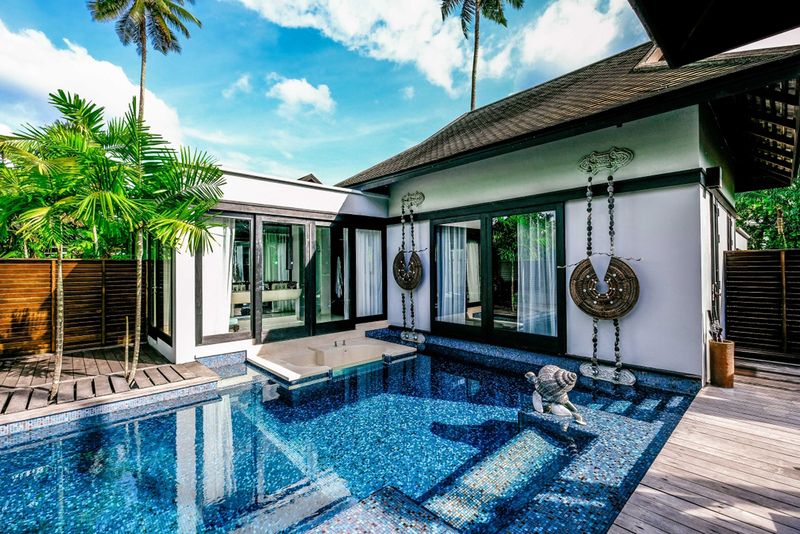 The schist keeps humidity – captures the sun and releases it at night, so that there is little temperature variation. 52 percent of all mountain vineyards in the world. Some grapes used in port and wine production: Touriga Nacional, Touriga Franca, Tinta Roriz, Tinta Barroca and Tinta Cão. The Douro Boys: 2003 marked the inception of the group comprising Quinta do Vallado, Quinta do Crasto, Niepoort, Quinta do Vale Dona Maria and Quinta do Vale Meão. 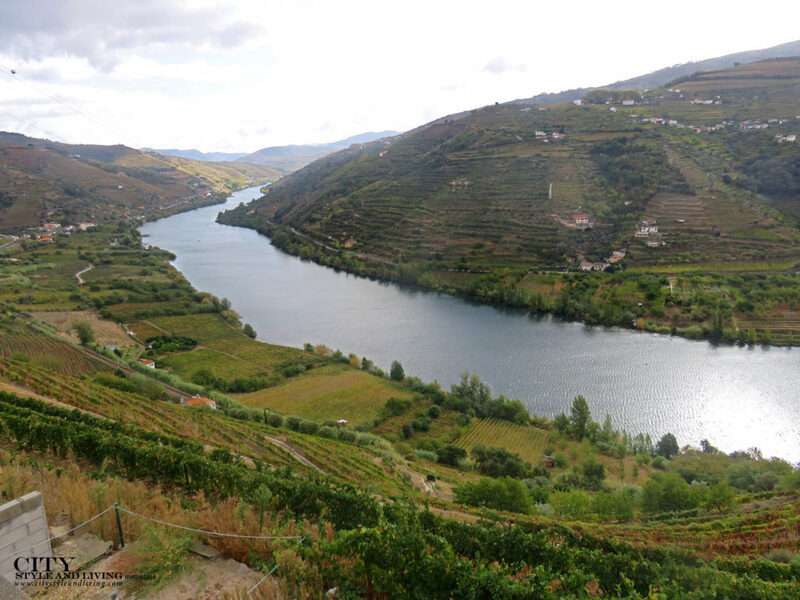 Their goal is to bring attention to the Douro Valley’s red and white wines (alongside the more well-known port). Douro River: From Spain to its outlet in Port, the river spans nearly the entire length of Portugal. This affordable yet full bodied wine, has a lovely blackberry-meets-earthy aroma and delivers characteristic dark fruit with noticeable oak, pepper and smooth tannins. In Portugal, towns founded by the King were anointed vila regia, Royal Village, and this wine pays homage with a deep purple-ruby colour. High acid, good body and dark fruit (think plum, and blackberry), balance earthiness and subtle cedar notes. A blend of tinta roriz, touriga franca, touriga nacional and tinta barroca from selected plots, this lush well-structured wine has fresh wild berry aromas, and delicate floral notes. With 60% touriga nacional grape, produced from vines in the Pinhão valley, the dark rich colour of this wine produces concentrated notes of dark cherry, plum and blackberry, balanced with soft tannin and touch of oak. In Vila Nova de Gaia, take an audio tour at one of the oldest port houses including the history, production and cellars. There are several tasting to select from starting with Taylor’s chip dry white port through a series of tawny and vintage port. 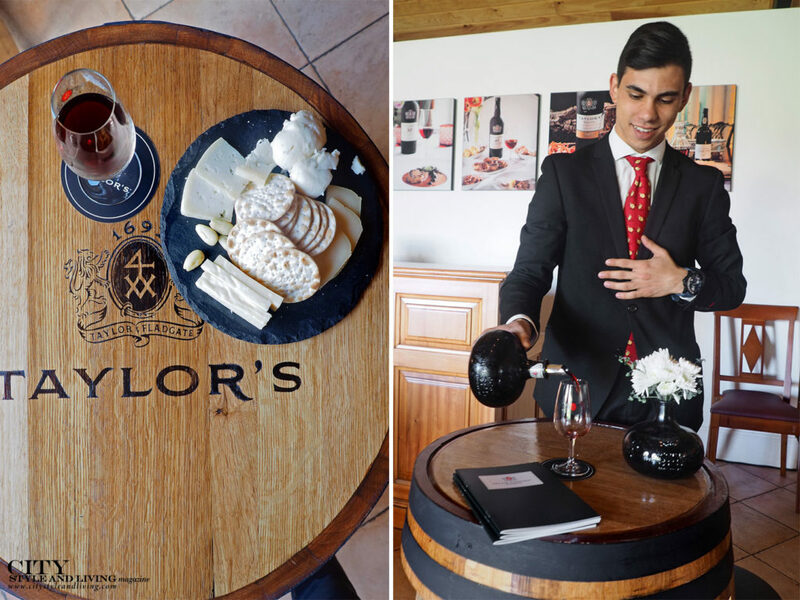 The 325th Taylor’s Anniversary Port, presented in the shape of a curved bottle from 1692, makes an extra special souvenir. Sandeman’s Quinta do Seixo reveals sweeping views of the terraced vineyards from the beautiful modern tasting centre. 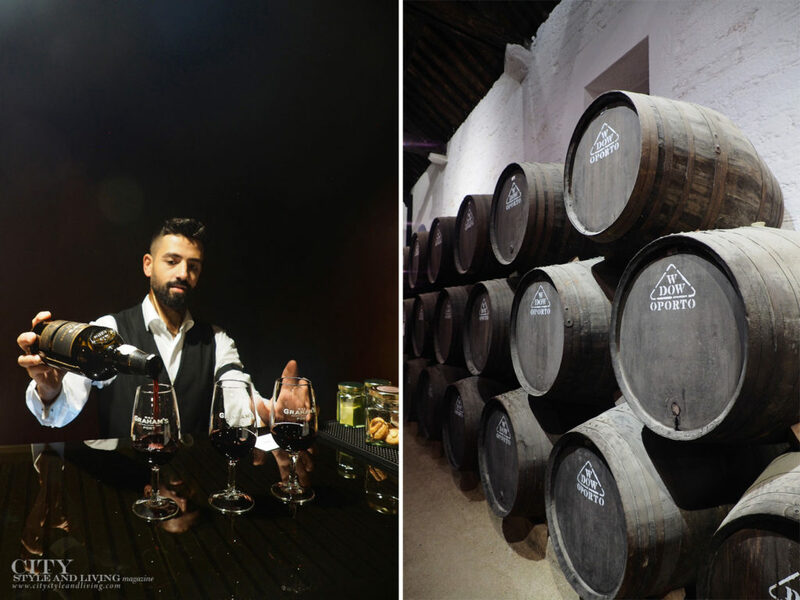 For the premium tour, guides wear signature Spanish caballero hat and Portuguese students’ black capes, taking guests through the cellars, the port production process and ending with a tasting white, ruby and tawny port. Five generations of the Symington family have produced some of the best award winning port. Guide João begins the tour in the small museum that houses a history of the family and property including photographs, and documents from the quinta. 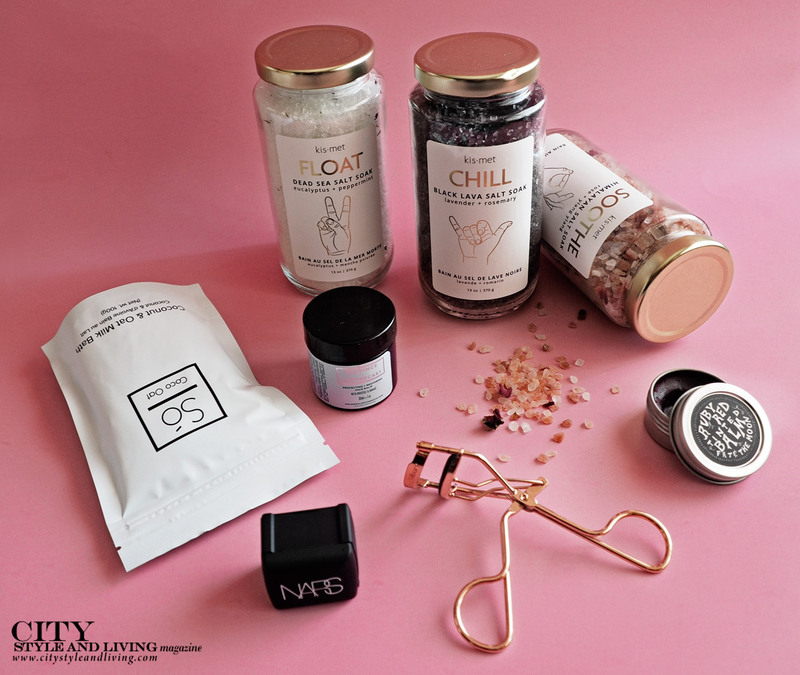 His dry humour is matched by his knowledge of the brand, creating a personalized experience. The smell of sweet port is immediately apparent throughout the 19th century old lodge, a relic in its own right and home to hundreds of vats and barrels that hold the prized liquid until ready to be taken to Vila Nova de Gaia for further ageing. A few sips of a selection of Dow’s vintage ports, their complexity recognizable is the prelude to a terrace picnic. 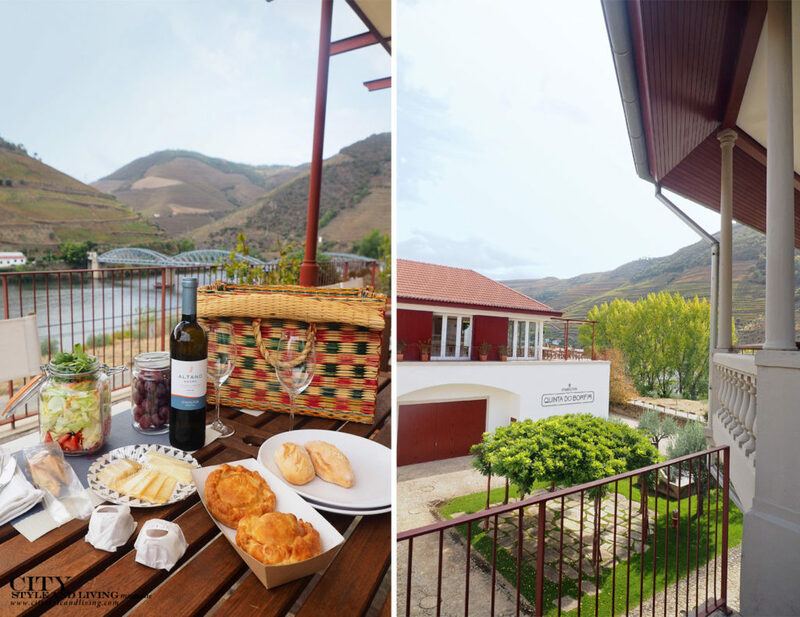 Charming wicker baskets are filled with vegetable samosas, meat pastries, salad, small cakes and of course a bottle of white wine – the perfect accompaniment to overlook the languid landscape of the Douro Valley. In the past several years, this carmine coloured fortified wine has seen a renaissance with no signs of stopping. Often eschewed as a drink for the older generation, this high alcohol wine has a much more rich and concentrated complexity than most would give credit. Not solely for pairing with dessert, think of port as a slow sipper like that of single malt scotch or brandy. So what exactly is it? Produced in Northern Portugal’s Douro Valley, and regulated by the Instituto dos Vinhos do Douro e do Porto, port is red wine that has only partially gone through the fermentation process at which point it is fortified with aguardente (brandy). The result is a sweeter, high volume alcohol (on average at around 20%) and signature flavour profile. Port can be either wood (vats or barrel) or bottle aged. While barrel and vat-aged port reveal nutty notes and can be consumed after shipping, bottle aged ports are best left for longer time periods to develop their complexity. This pale tawny retains some of the youthfulness of a ruby, while also showing signs that it has benefited from slow maturation in wood. 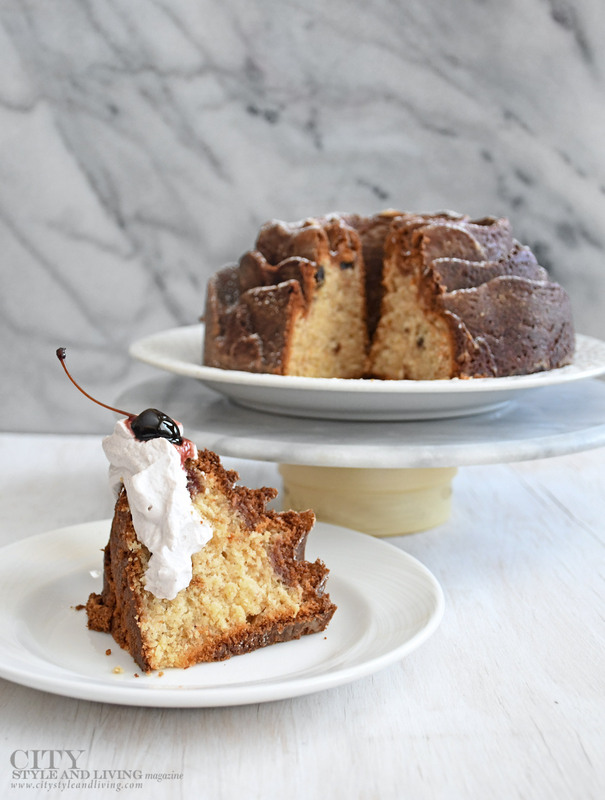 It is full of nuttiness as well as caramel, maple and fig. Top in its class, this tawny is refined and elegant. The mahogany colour gives way to a balanced port, with natural acid to counter the sweetness and enough tannin to deliver a crisp finish. Herbaceous notes, brûlée and nutty notes can be detected beneath the primary red fruit flavour. A blend of ruby ports and aged for five years, it offers complex notes of leather and wood combined with dark cherry to add balance to the typical fruit forward style. Rich with fruit both dried and fresh, this port had an extended time ageing in barrel producing a light amber coloured tawny. Layers of raisin and fig are brought to the fore, with a slight peppery edge and long finish on the palate. 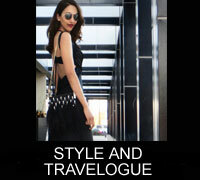 We suggest you find a style that suits you, and explore the libation from several port houses. A great introduction to the world of port, rubies are blends of several vintages that have spent a few years in vats. The trademark vibrant colour is due to less contact with wood and reveals ripe dark fruit like plum, and berries with an approachable price point. Ruby port pairs best with milk chocolate, and blue cheese. These are ruby ports that have been vat-aged for four to six years, and produced from a single year. Abbreviated as LBV, and carrying the bottling date on the label, this style is richer than regular rubies, with more balance and deeper fruit flavour. Ready to drink when purchased, this style must be decanted for several hours for sediment buildup to settle. The top tier of ruby port which should be cherished. Made only in the best years from a blend of the best grapes from the best vineyards, these ports have been aged in vats for only two years, and require further development in the bottle for 10-50 years. Like any investment, count yourself lucky if you are the recipient of a vintage port; fewer than fifty vintage ports have been released since 1900. A blend of several vintages, tawnies are ruby ports that have been aged for between ten and forty years in casks resulting in an amber, or puce colour due to faster oxidation and oak contact. Ageing softens the fruit and the port takes on more complexity like nut, caramel, and sometimes leather and spice notes and silky mouthfeel. Pair with toffee, crème brulee or strong cheese. White port is not new. But, using it in cocktails like the port and tonic (P&T), a new iteration of the classic gin and tonic, just might be its latest incarnation. The result of using white grapes in the production of fortified wine, white port is less well-known than its tawny and ruby cousins. Adding it in one part to 2 parts sparkling tonic water makes for an off-dry cocktail that pairs perfectly with Portuguese appetizers like grilled sardines, cheese and almonds. In Portugal, P&T’s are served on ice, with a twist of citrus and sprig of mint. Fresh and light enough to be enjoyed through the summer months, we think you’ll agree, it’s one of the best things to cross the pond.